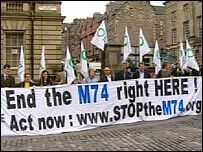 Two environmental groups have dropped their court case against the decision to extend the M74 in Glasgow. 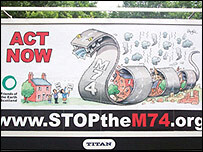 Friends of the Earth (FoE) Scotland and Joint Action Against the M74 (Jam74) ended their action on legal advice. The groups had been appealing against a decision by the Scottish Executive to press ahead with the £500m motorway extension in Glasgow. The case was being heard by Lord Nimmo Smith, Lord Philip and Lord Clarke at the Court of Session in Edinburgh. Andrew Smith QC, senior counsel for Friends of the Earth, admitted that the decision to abandon the case might "raise eyebrows". However, Lord Nimmo Smith told him: "There is no question of regarding it as frivolous." The court was told that the Scottish Executive would not be seeking expenses from the campaign groups, although they will have to pay their own costs. Duncan McLaren, the chief executive of FoE Scotland, said they had come to the conclusion during opening submissions that the judges did not intend to accept the grounds of the appeal. After consulting with their legal team, the campaigners decided it would be "irresponsible" to continue with the action. "We are enormously proud to have fought for economic and environmental justice for the disadvantaged communities of Glasgow south," he said. "It is with bitter disappointment that following guidance for the bench and legal advice we have been forced to withdraw from this appeal. "This case illustrates just how hard it is to get justice for communities and the environment in Scotland." He said there was now nothing to stop the executive from pressing ahead with the motorway expansion "except their own consciences and escalating costs". Ministers have said the link is vital to the area and pressed ahead with the plan despite the recommendation of a public inquiry reporter. The green campaigners argued that ministers had acted contrary to natural justice in reaching their decision. Under the plans a six-lane elevated motorway will be constructed across the south of Glasgow. Green MSP for Glasgow Patrick Harvie said politicians were likely to "pay dearly for their decision to ride roughshod over people and the environment". He added: "The end of the court case in no way diminishes the clear case against this monstrous motorway project. "Ministers cannot hope to get away with forcing the people of Glasgow to bear the environmental and social injustice that this road represents." Glasgow City Council leader Steven Purcell said: "The M74 extension will bring economic and social benefits to the entire west of Scotland. "Not only will it help reduce congestion in different areas of Glasgow, it will help secure and create thousands of jobs. "This project must now be delivered as quickly as possible to deliver all these benefits to Glasgow and beyond." A spokeswoman for Transport Scotland said: "We are pleased the appeal has now been abandoned. "It's unfortunate that this action has delayed the scheme by two years. However, we will now start work in earnest to prepare for tendering the scheme. "This is a vital construction project which will have huge benefits not only to Glasgow but to the west of Scotland." It is aimed to start construction in 2008, with the project being completed in 2010.